NEW YORK, Associated Press -- A perfect storm of potential greeted the slumping New York Rangers when the battered and beaten Pittsburgh Penguins came to town at the end of a long, emotional weekend. Pittsburgh was missing injured stars Sidney Crosby and Evgeni Malkin and was down in toughness with Matt Cooke and Eric Godard serving suspensions. Throw in the fallout of Friday night's fight-filled blowout loss on Long Island, and the Penguins were a seemingly early target for the Rangers, who had lost six straight. When New York fell behind by two goals in the opening 5:06, coach John Tortorella called a timeout that turned around his team's fortunes. 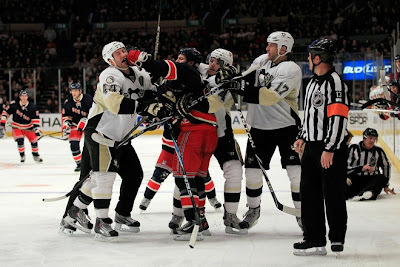 The Rangers scored five straight goals and beat the makeshift Penguins 5-3 on Sunday. Behind a struggling power play that produced three goals in a game for the first time this season, the Rangers broke an 0-5-1 slide. "Even though they made a few plays and scored early, we felt good about our game," forward Brandon Dubinsky said. "We just kept grinding away. We had two tips-ins." Ryan Callahan had two goals and an assist to help the Rangers win for the first time since he returned from injury on Feb. 1. New York took advantage of Pittsburgh's NHL-leading, penalty-killing unit. The Rangers tied it before the first intermission and busted out in the second period -- while recording 16 shots -- on goals by Vinny Prospal, Callahan, and Artem Anisimov. That was enough to end the skid that put the team's playoff hopes in jeopardy. The Rangers hadn't won since beating Washington 2-1 in a shootout on Jan. 24. "It's definitely good to stop the bleeding," Callahan said. "We put ourselves in a little bit of a bind standings-wise. With this one, we can start looking at teams ahead of us, not the teams behind us." New York's rally was sparked by Tortorella's timeout called after Nick Johnson's second NHL goal. Deryk Engelland had given the Penguins a 1-0 edge at 2:06. Brett Sterling brought Pittsburgh within 5-3 with a power-play goal 5:12 into the third, but the Penguins, who failed to capitalize on a double high-sticking penalty to Michael Sauer later in the period, have lost four of five following a five-game winning streak. New York hadn't scored more than three goals since beating Toronto 7-0 on Jan. 19. The Rangers scored only 12 during the losing streak, but found their touch against Pittsburgh goalie Marc-Andre Fleury. 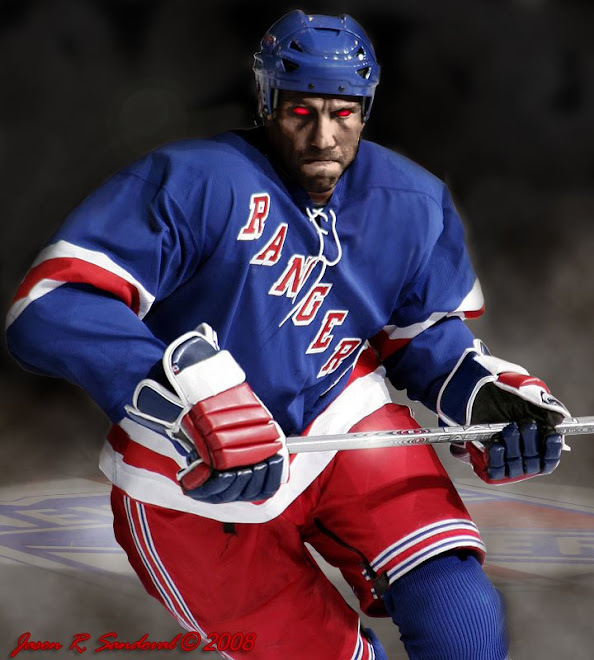 In its previous 20 games, the Rangers connected for only eight power-play goals in 70 chances. The Penguins tried to get back to normalcy in their first game since Friday's 9-3 loss that produced 346 penalty minutes, 10 ejections, 15 fighting majors and 20 misconducts. Pittsburgh coach Dan Bylsma said he didn't sense any carry-over into Sunday's game. "We tried to forget about what happened Friday night and focus," defenceman Kris Letang said. "We came out and had a good first half of the first period, and a penalty killed us." Upset with the supplemental penalties handed out by NHL disciplinarian Colin Campbell, that included a US$100,000 fine to the Islanders, Penguins owner Mario Lemieux lashed out at the league. "Hockey is a tough, physical game, and it always should be. But what happened Friday night on Long Island wasn't hockey. It was a travesty," the Hall of Famer said. "It was painful to watch the game I love turn into a sideshow like that." Lemieux, who bought the team out of bankruptcy in 1999 and ended his playing career during the 2005-06 season, said the sanctions weren't nearly enough. "The NHL had a chance to send a clear and strong message that those kinds of actions are unacceptable and embarrassing to the sport. It failed," he said. "We, as a league, must do a better job of protecting the integrity of the game and the safety of our players. We must make it clear that those kinds of actions will not be tolerated and will be met with meaningful disciplinary action. "If the events relating to Friday night reflect the state of the league, I need to rethink whether I want to be a part of it." His team responded well early, and it appeared as though the Rangers were headed for another loss. New York hadn't earned a point in a game since a 4-3 shootout loss to Pittsburgh on Feb. 1 after the Rangers squandered a two-goal lead. Before Sunday, that was the last game the Rangers were ahead by two. Callahan scored the first of the Rangers' power-play goals at 9:20 of the first. Brian Boyle had started the comeback at 5:43, 37 seconds after Tortorella's timeout. New York broke it open in the second, starting with Prospal's second goal in five games after returning from knee surgery. Callahan made it 4-2 at 11:04 during the first half of a double high-sticking penalty to Sterling. Anisimov pushed the edge to three with another power-play goal with 4:37 left in the second and ultimately put away Pittsburgh.